I am a 17-year-old Nigerian-American student in my senior year at the Environmental Charter High School in Los Angeles. I am also a social- and environmental-justice advocate. I am one of the first high schoolers to get an LEED Green Associate certification, and I am the recipient of the 2017 GrowingGreat Youth Leadership Award. Whenever I speak at green conferences or events, I can’t help but notice that I usually am the only black woman there. Sometimes, there will be other people of color in the room, but the majority of people associated with environmentalism are white. There is a lack of diversity in the organizations fighting for diversity in nature. By attending an environmental school, I was provided the resources and education that fueled my passion for this field. I probably wouldn’t have received these experiences had I attended a different school. There is a lack of access for other students who would love the environment, or science in general, if only they had the opportunity to experience it firsthand. That is why I created a program called Gravel to Green. The mission of this program is to take students and their families from the South Bay in Los Angeles and expose them to green spaces. Food and transportation are provided, and everyone is invited. I partnered with the Sierra Club’s Inspiring Connections Outdoors program and was awarded a grant from the California State Parks Foundation. Through my school, I volunteered for several weekends on the Pacific Crest Trail, and in 2016 and 2017, I traveled to Washington, D.C., with the PCTA to advocate for the trail during Hike the Hill. The PCT motivated me to create Gravel to Green by, honestly, just getting to experience it. Being surrounded by your closest friends while laughing and genuinely enjoying yourselves is a moment you don’t get too often, not to mention the sense of immense pride you feel after the work is finished. It’s a feeling that the cold, the raccoons and the layers of dirt can’t diminish. I wanted other people to have that feeling as well, and I wanted them to share the same passion for the preservation of the environment as I do. Attending Hike the Hill awakened my love for policy and gave me a multitude of resources, friends and experiences that will stay with me forever. During our Gravel to Green hikes, we emphasize the importance of environmental literacy and the power and potential impact of one person’s voice. Often people feel like they can’t make a difference in the world by just being passionate about a topic. It is that passion, however – that fire inside your heart – that can create power and drive whole revolutions. My hope is to help more Latino students become aerospace engineers, more Muslim people to become architects, more young women to become environmental lawyers and more black graduates to become leaders in the Environmental Protection Agency. Even if only a few of the students go on to pursue jobs related to environmentalism, I know that they can all incorporate green practices into their careers and lives at any time. 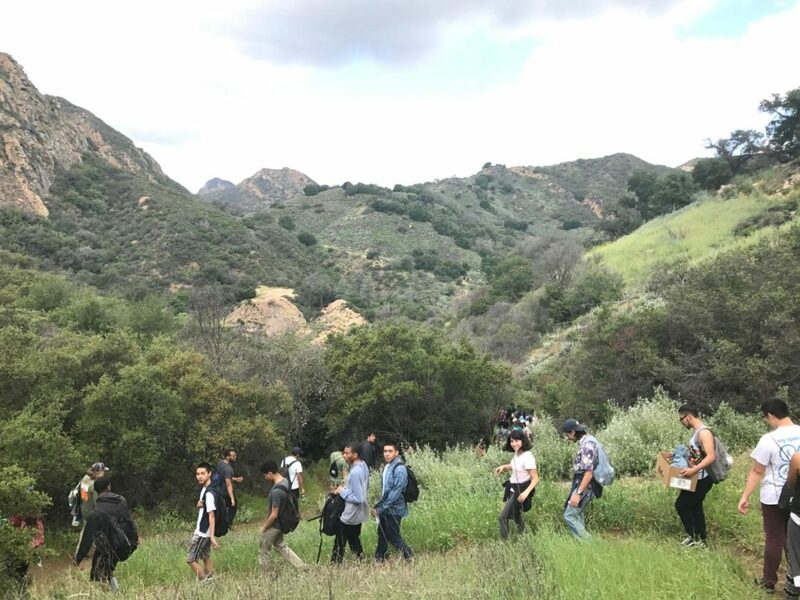 Gravel to Green recently held its first hike at Malibu Creek State Park with students and family members ranging from 6 to over 60. There were 41 people on the hike, and a handful of them had never been hiking before. We hiked through (and tasted) mustard plants, got to see people cannonball into a creek and watched someone get a “promposal” on the hike. Everyone said that they would bring their families to visit again and that they had enjoyed themselves. People have already asked to RSVP for the next hikes. This enthusiasm rebuts any statement that says people of color don’t care or want to be in the environment. This program was my call to action to not only discredit that stereotype, but to also inspire others to make changes in their communities. It was important for me to stress the fact that the environment we should all be fighting for isn’t just some forest, thousands of miles away. It’s your home. It’s your neighborhood. Nature is literally all around you no matter where you live, whether it’s in a city or a suburban neighborhood. Your environment is your community. Unfortunately, lower income people and people of color reside in areas that have higher amounts of environmental degradation than their more affluent counterparts. I can attest to this, as I live within a mile of an airport and go to school near one of the biggest freeways in Los Angeles. On the hike, I spoke about how you can change your communities in a multitude of ways. For example, I have worked with SpaceX on building a community garden in my neighborhood, and I have pushed for compost bins in my community. The size of the project, however, doesn’t matter as much as the impact does. Simply planting a few seeds to create a garden with your family might seem like a small step, but it could escalate into a community garden that feeds your whole neighborhood. I want my project to be able to sustain itself and grow long after I’m gone. I want schools to partner with their state parks and green spaces so that students in other parts of the country are allowed the same access and the same opportunities I had. I want students to use their voices to demand and create the change they want to see, no matter how big or small. It is often said that there is no footprint too small to leave an imprint on this world. But before you make that footprint, you must first take a step forward. After graduation, Ogechi begins a summer internship with Rep. Maxine Waters of California. She’s off to UCLA in the fall. For more information about Ogechi’s program, visit www.ecsonline.org/gravel-to-green. Click on the photo above to view the original article.